The January WER report provides details for the Sea Lion FPSO FEED contract, profiles two FLNGs about to be completed, discusses the impact of the oil price collapse on deepwater investment decisions, updates the Petrobras situation and looks at ConocoPhillips’ decision to exit deepwater exploration. 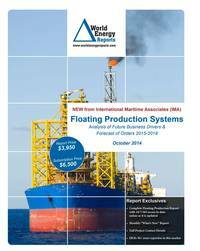 In the data section of the report are details for 255 floater projects in the planning stage, 65 production or storage floaters now on order, 281 floating production units currently in service and 27 production floaters available for redeployment contracts. Charts in the report update the location where floating production and storage systems are being planned, operating, being built and to be installed. Accompanying excel spreadsheets provide the report data in sortable format. Information is current as of 22 January.